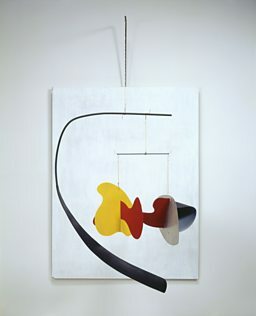 Triple Gong (c.1948) Calder studied engineering, then painting, and worked as an illustrator before turning to sculpture. 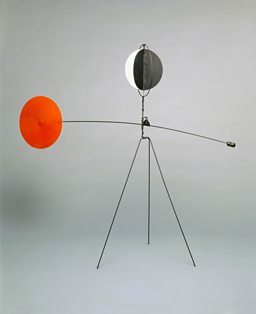 Alexander Calder transformed our idea of what sculpture ought to be. He freed his sculptures from plinths and pedestals. He hung them from the ceiling. He made them move. He made them sing. These ‘performing sculptures’ were so novel that Marcel Duchamp coined a brand new term for them. Duchamp called them ‘mobiles.’ And now some of Calder’s finest mobiles (and many of his other sculptures) have been brought together in a bold new show at London’s Tate Modern. Rower adored his grandfather’s work from an early age. “When I was three or four, there were certain sculptures that I really wanted to have. I understood that they were sculpture, that they weren’t toys - that they weren’t to be played with.” But he loved them all the same. He grew up around Calder’s artworks. One of the sculptures in this exhibition used to stand in his parents’ bedroom. 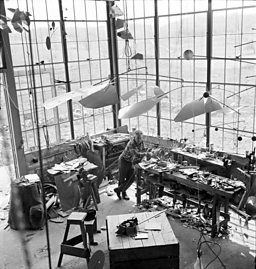 Alexander Calder was born in Pennsylvania in 1898. Art was in his blood. His father and grandfather were both sculptors. His mother was a painter. He studied engineering, then turned to painting, and worked as an illustrator in New York. In 1926 he moved to Paris and his career took off. Paris in the 1920s was the centre of the art world. Here, Calder befriended many of the leading artists of the age. His wire sculptures of Joan Miro and Ferdinand Leger were brilliant portraits, but his greatest inspiration was the circus. “It wasn’t the daring of the performers, nor the tricks and gimmicks,” said Calder. “It was the fantastic balance in motion.” His circus sculptures capture that balletic beauty. They’re full of life, and fun. In 1930, Calder met Piet Mondrian, and his art changed course again. 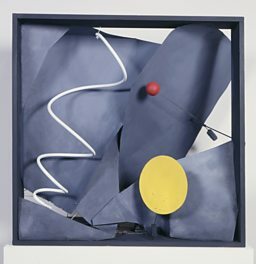 He was excited by Mondrian’s abstract paintings, but Calder added another element – movement. Drawing on his engineering background, he constructed a series of mechanical sculptures which brought a new dimension to this art form. 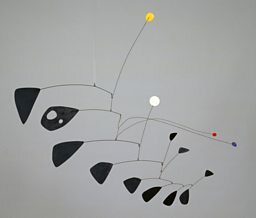 Calder likened it to choreography. In 1937, during the Spanish Civil War, he made a fountain for the Spanish Republican Pavilion at the Paris Exposition. It was shown alongside Picasso’s Guernica – two liberal masterpieces, side by side. Calder broke down the boundaries between the plastic and performing arts. He collaborated with dancers and musicians. He worked with composers like John Cage. His art belonged to every genre, and none at all. You could say he was the world’s first performance artist. Yet it was his mobiles which became his trademark, and so it’s fitting that they form the climax of this graceful show. There’s something mesmeric, almost hypnotic, about them. Time seems to slow down when you’re watching them. Even in a still and silent gallery, they’re always shifting – reacting to every movement in the room, however slight. He was a generation older than Warhol or Lichtenstein, yet he actually seems more modern. Most of the exhibits in this show date back to the 1930s. They still appear avant-garde today. Excerpt from a 1955 film by Jean Painleve, published on YouTube by Whitney Museum of American Art.